If you are any­thing like me, your cal­en­dar is packed so full of backgam­mon tour­na­ments, fundrais­ing galas, and all-expenses paid inter­na­tional expe­di­tions that it can become dif­fi­cult to keep the days straight. How­ever, there is that one teensy issue that most cal­en­dars are hideous, and will imme­di­ately take that stun­ning min­i­mal­ist home of yours down about five notches on the chic scale — so what’s a design­erly social but­ter­fly to do? 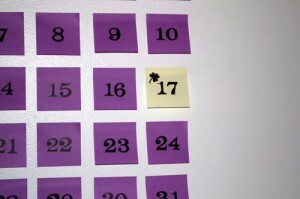 Take a cue from this week’s post, and fash­ion your own beau­ti­fully min­i­mal­ist calendar! Exhibit A — Pen­man­ship wasn’t a huge waste of time! 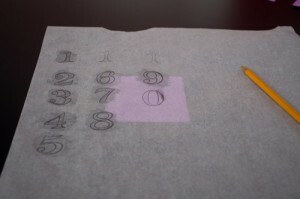 Step 1: As you are a good lit­tle diy-er, I expect that you already have your favorite font picked out, so the first step is to cre­ate your trace sheet. I would imag­ine that most other peo­ple endeav­or­ing to cre­ate this cal­en­dar will be more high-functioning than myself and have a printer with ink in it. Should that be the case, size out your font and type all the num­bers from 1–31, and print in a size that looks good cen­tered on a Post-it note (my num­bers are about 1.25″ tall). For those of you that are low-functioning mem­bers of soci­ety and have a printer, but no ink (or maybe no printer at all…), sim­ply size up the font on your com­puter and trace it onto the trace paper (just the num­bers zero through nine, you can pair them up when you trans­fer them). 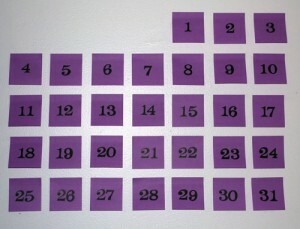 Step 2: Trans­fer the num­bers to the Post-it notes. This is where the trans­fer paper comes in handy. 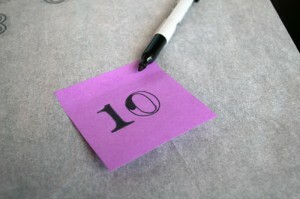 If you have it, sim­ply place it between the printed page and the Post-it, and trace the num­ber. If you do not have trans­fer paper, no wor­ries, just scrib­ble a bunch of graphite onto the back of the page where the num­bers are, and then trace them onto the Post-it notes. When you are trac­ing the num­bers, be sure to check that they are straight and cen­tered in the Post-it or all your efforts will be wasted because it will look stupid. Exhibit C — Killing the brain cells. Step 3: Trace the trans­fers with the Sharpie. 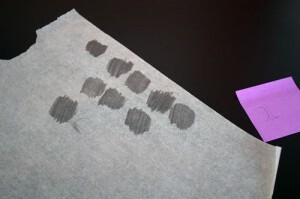 Use your fine point Sharpie to out­line all the num­bers you just trans­ferred to the Post-it notes. Once you have them out­lined, color them in with the reg­u­lar point Sharpie. Be fore­warned — your hands will be cramped and you will kill a lot of brain cells by the end of Step 3. Exhibit D — Get all your ducks in a row. Step 4: Stick it to the wall. * I like to use a straight edge to make sure all the Post-it notes are aligned. Check the cal­en­dar, and put up the dates accord­ingly. The fun thing about this cal­en­dar is you can stick it up in a stan­dard cal­en­dar for­mat as shown here, or you can play around with it. If you have a long lin­ear space, it could be fun to line up all the Post-it notes side by side. Get cre­ative, because you’re the only one who has to under­stand how to read it! * You will find that after a few days the Post-it notes start to fall off the wall, I usu­ally just put some double-sided tape on them and they hold up just fine. Exhibit E — Give your­self some­thing to look for­ward to! 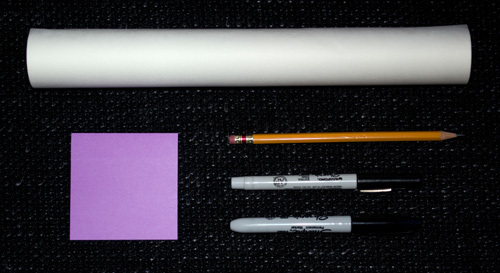 Step 5: Add hol­i­day Post-it notes. I like to use a dif­fer­ent color Post-it note for the hol­i­days, and just make an extra Post-it for whichever date the hol­i­day falls on. Step 6: Change it each month. 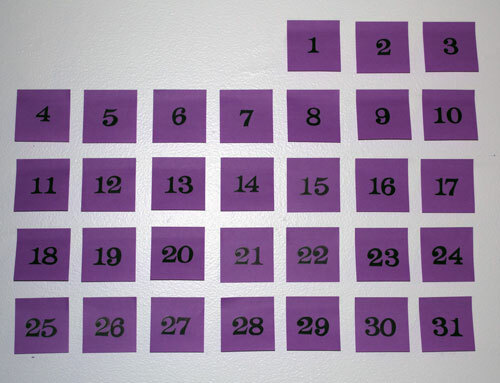 The great thing (and sus­tain­able thing) is that you only have to make this cal­en­dar once — each month just move the Post-it notes around! Pretty sim­ple stuff, but it looks pretty spiffy once it is all fin­ished. So kiss your kitschy hobby cal­en­dars good­bye and step up to a more beau­ti­ful way of keep­ing track of all your dates! Thanks for read­ing — as always, please feel free to share my work, just please give me credit when you do. Cheers until next time! Leave a reply on "How to Make a Sustainable Minimalist Calendar for Under Five Bucks"